If you're at Hilltop Park, make sure that you stop by Ridgetop Plaza, a small landscaped area and hardtop with a view of the area. Walk further down Whitney Young Circle (and Bell Ct.) and find another beautiful green space to explore. 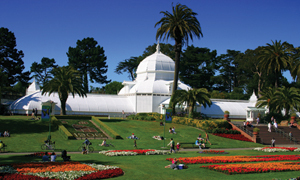 Ridgetop Plaza is owned by the San Francisco Recreation and Park Department. 44-O'Shaughnessy -- Whitney Young Circle and Progress Street.